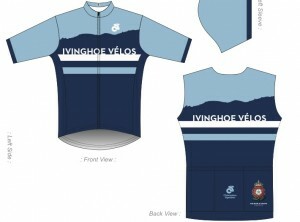 The designs have been finalised and the kit shop is open for orders. The first run will have a small window of opportunity to get your order in. This is so that we can close off the order and get it in to production ASAP. This run will close for orders on April 6th. See below for how to order your kit. We need at least 10 big items (tops or bottoms) to be able to close the order. Given the current interest, that really shouldn’t be a problem. Once this first order is done, we will gauge interest in opening another slot with a longer deadline so please don’t worry if you miss the first batch, there will be a further opportunity. This is the only time you will need to use those login details. The system will ask you to register using your own email address and password. These personal details are what you can use the next time you come back to the site. Once registered, you should be presented with a “My Account” page that lists our “Ivinghoe Velos Store” and an “Order Now” link. You can then choose and pay for the kit items you would like to order. Once manufactured, all of the clothing will be sent as one delivery to Sally who will assist with distribution. There is a wide range of items available. Please read the descriptions of each item type carefully to ensure that you order the correct bit of kit. If the forecast is to be believed, it is going to be a bit of a damp one so winter bikes with mudguards will probably be a good idea. To ease the pain, Mr Dave “The Cheeseman” Bembridge has put together a couple of very flat routes. As always, we depart from the Rose & Crown, Ivinghoe. Please bring a copy of your chosen route with you if you can. And just in case … please bear in mind that the clocks go forward tonight ! Just a quick hello to the new riders on the Tea Ride today. It is great to see the group growing and we look forward to you welcoming you all back for more cake soon. Next Saturday will be the Easter Bonnet Tea Ride Parade – with prizes! A bit of Eminem this week I think! 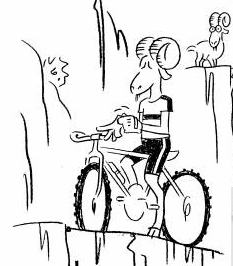 Well, it’s not just me that’s a goat… it’s all my fellow tea riders too. Whatever the weather, we’re out there in search of tea and cake, in places both familiar and new. And tomorrow is no exception. We’re going to Stoke our inner furnaces and pedal our way over to the Centrum Capra. I can’t promise it will be the G.O.A.T. – but we love an adventure! See you at the Rose & Crown, Ivinghoe, ready to roll at 10am. There will be another opportunity to try on the the sample sizes of the new kit this Tuesday evening, between 8 and 9pm at the Rose and Crown, Ivinghoe. The designs have been signed off so we should be able to publish the link to start placing orders early next week. Expect a posting here as soon as we have more details. Some of our members are riding The Chilterns Cycle Challenge on Sunday so there is a plan for those who are taking on the 75 mile route to ride over to the start together. This should result in a 100 mile round trip which will be great to get under our belts this early in the season. The pace will be steady rather than brisk so do please join us if you fancy it – registration is available on the day. We are departing from Pitstone Roundabout (The one near the Memorial Hall) at 7:30am sharp. Both of these rides have been kindly supplied by Mr Dave “Routemaster” Bembridge. Just a reminder that we have a discussion home on Facebook called the Ivinghoe Velos Rear Hub that is being regularly used to arrange various mid-week rides. If you are not already on Facebook it is worth signing up just for this ! The Queen of Teas is in Charge! So the Cat is still away in the mountainous Mallorcan regions… and the understudy is entertaining elsewhere… which puts Mary, Queen of Teas, firmly in the throne of control for this weekend’s Tea Ride. Leaving the Rose and Crown at 10am, this week your travels will take you to the exotics of Cheddington, Long Marston, Puttenham and onto Mead Farm Shop for refreshments. As always, everyone is welcome – all abilities and bikes, regardless of age or experience, are welcomed. Going as fast as the slowest rider, the group sticks together throughout. New to cycling or not ridden for a while? The Tea Ride is where it’s at! We have a big announcement. Our resident graphical designer, James Fairburn has kindly redesigned our kit. It keeps the colour ways of the original design whilst updating it to reflect the changes in the types of rides we are going on. James has managed to include the profile of our iconic climb – Ivinghoe Beacon – which completes what we think is a fantastic design. The kit will be supplied by Champion Systems who have an online ordering system meaning you can place the order directly on their website saving the huge effort previously to collect monies from those interested. We will let everyone know exactly how to order later this month. Champion have sent us some sample sizes to help with gauging which top is right for you. There will be a number of opportunities to try on the samples, starting with tomorrow after the ride, at the Rose & Crown. Full details of what the kit will look like are contained in this PDF file. We have two on offer, both pretty flat. As always, please bring a copy of the route with you either on paper, or on your GPS gadget. Which means us mice must play…. Nice easy (fairly flat) route in mind for tomorrow … unless you have your own ideas? The weather is improving so the options are extending. Mr Dave “The Hill” Howe has designed a 40 miler to tempt us. The other rides have been sent in by Mr Dave “More Hills” Bembridge and are hillier but less distance. So your choice this week is distance or elevation gain. As usual, we start from the Rose and Crown and always advise bringing a copy of the route with you. Then go ahead and move along…. This weekend sees Miss W’s birthday…. slightly longer pre-tea ride – Chedd, Long Marston. Aston Abbotts, Cublington and back to The Stag at Mentmore for Birthday Cake 11.15/11.30am. If you’re not able to ride and plan on joining us there, please let us know to expect you! As ever…. leaving the Rose & Crown, Ivinghoe at 10am.